The Toomai String Quintet is an ensemble devoted to performing music from the classical and contemporary repertoire while exploring and arranging music from around the world. Winner of the 92nd St. Y’s 2007 Music Unlocked! Competition for emerging ensembles, the Toomai String Quintet is dedicated to creating engaging interactive concerts for audiences of all ages. Hailed for their “light-handed authority” on their “magnificently executed” recording of composer Jessica Pavone’s Songs of Synastry and Solitude (Tzadik Records), Toomai has performed in many capacities throughout the United States, with appearances at Lincoln Center, the 92nd St. Y, Philadelphia Arts Alliance, and for the Miami Civic Music Association, among others. The quintet was a pilot ensemble for Carnegie Hall’s “Musical Connections” program, and they continue to perform regularly in schools, hospitals, and alternative care facilities throughout New York City. 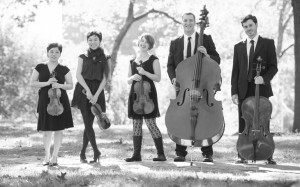 In addition, the Toomai String Quintet has brought its array of educational programs to students in California, Florida, and across the Northeast, and has presented interactive concerts in collaboration with organizations such as California Institute of the Arts, The Juilliard School, and Carnegie Hall’s Weill Music Institute. Formed in 2007 at The Juilliard School, the quintet is named after Rudyard Kipling’s short story “Toomai of the Elephants” in which a young boy journeys into the jungle to witness the dance of the wild elephants. The Toomai String Quintet aspires to cultivate a similar sense of curiosity and discovery by searching for diverse music and sharing it with their audience. The quintet is comprised of violinists Emilie-Anne Gendron and Pala García, violist Erin Wight, cellist John Popham, and bassist Andrew Roitstein.